might expose us, lay some body-part bare. goose bumps freckling our pale skin. 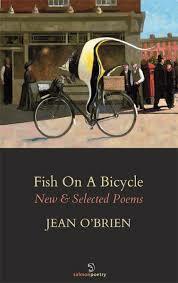 Jean O’Brien‘s fifth collection is New & Selected Poems: Fish on a Bicycle, Salmon 2016. She has won the Arvon International Poetry Award and the Fish Poetry award as well as being placed in many other competitions, most recently her work was Highly Commended in the Forward Prize (2014). She holds an M.Phil in Creative Writing from Trinity College, Dublin and tutors in CW.